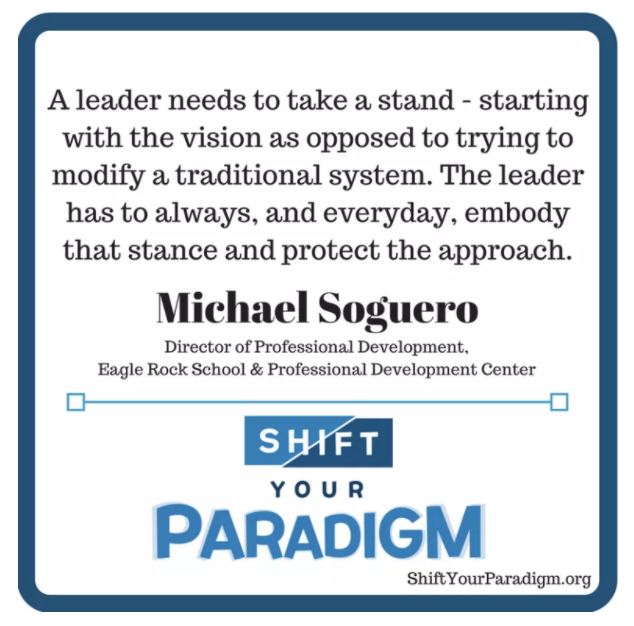 Episode 32 takes us to the Eagle Rock School & Professional Development Center in CO and a conversation with Michael Soguero, a founding member and Director of Professional Development at the Center. Located in Estes Park, Colorado, with an enrollment of 72 students, Eagle Rock School implements practices that foster each student’s unique potential and helps them use their minds well. Eagle Rock School serves adolescents who are not thriving in their current situations, for whom few positive options exist, and who are interested in taking control of their lives and learning. The school provides grounding for the professional development center work of supporting engaging, progressive education practices throughout the United States. The Eagle Rock Professional Development Center works with educators committed to making high school a more engaging experience for youth. Through their unique services and offerings the PDC strives to accelerate school improvement and support implementation of practices that foster each students’ unique potential. What have you learned today that can accelerate your school on the path toward learner-centered education? How might you reshape your work in shifting the mindset of the adults in your school through professional learning?